Today is marks the first day of a new month. I wanted to take a few minutes to look back on what I learned from my first month blogging in this little space, and what things are going to look like moving forward. I’m almost finished reading Blog Inc. by Joy Cho and the whole time I’ve just been thinking about how every blogger should read this. I especially feel like anyone who is thinking about starting a blog should read it. Blogging is such an amazing platform and opportunity that I think so many people could benefit from. It’s brought me a lot of opportunities and helped me grow in so many ways. Since many of my favorite posts are all about blogging, I thought it would be fun to give a copy to one of you guys- my lovely readers! This blogging thing wouldn’t be much fun without you, and I don’t say how much I appreciate you and your participation in my blog nearly enough. Leave a comment- it can be about anything! Don’t worry about leaving an individual comment- I’m doing this the old fashioned way! The giveaway will close at midnight on Thursday, October 4th (my birthday!) and I’ll announce the winner on Friday. Good luck! 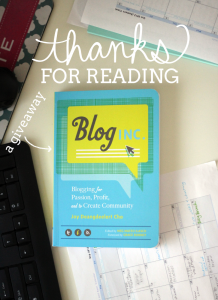 FYI- I happily purchased my copy of Blog Inc. and will purchase the copy for the winner. Oh Joy! is in no way affiliated with this post- I just genuinely enjoyed the book and thought you guys would too! And because I can’t post a vlog without making fun of myself- can we talk about how ridiculous I look when I hold things up and try to get them on screen? Also, do I always sound/look like I have marbles in my mouth? And the end is total awksauce. In my defense, this was like the 50th take. I would love to read this book! And I already stalk you all over the internetz. :) Because I am classy like that! I’m in the middle of reading Joy’s book, as well. I love it! As a new blogger, you can never have too many tips from more seasoned bloggers. I’ve been one of your Tweeps for as long as I’ve had Twitter! I semi-stalk you on FB. You’re in my Daily Reads list on Bloglovin’. First of all, you are so cute in your blog! Haha. Not awkward at all. Also, that’s so nice of you to giveaway the book with your own hard-earned cash. I can appreciate that! I have the book on hold at the library, but they have just ordered it. This means that I can (hopefully!) win this giveaway, have it shipped to me and it will still probably get here before my library copy is ready. Haha. Here’s hoping! Ohh… I’ve been wanting to read that! Good to know you’re finding it helpful! Blog Inc. has been on my reading list for awhile! I haven’t read that book yet, but I think it’d be a good book to read for sure!!! follow you on bloglovin, twitter and pinterest! I’ve been wanting to read that one for a while — great giveaway! I like your facebook page, follow on twitter, and on pinterest! I heard that it was amazing! Love that you are giving a copy away! OKKKK this is so cool. I Love giveaways that aren’t endorsed! I like a vlog … it allows me to replace the guessed upon voice in my head I have assigned to you with your real voice. Ooohh I’m excited about this! One of my other blog friends just bought this book & I’ve been wanting to read it! somehow i recently stumbled upon your blog & so glad i did! video has been on my list of things to do for a bit now so thank you for inspiring me to get moving on it. time to kick that perfectionist self to the curb and go for it. kudos to you. This looks like something I probably should read. Great recommendation. Sounds like a great book! I’d love to win a copy! Happy Birthday!!! You share the same birthday as my brother so it’s easy to remember :) I discovered your blog about a week ago…you inspired me. I’m in the middle of starting to design some WP sites and to see that you started a little over a year ago designing sites makes me feel hopeful. Thanks for sharing your insights with us. Enjoy your special day! Thanks Sandy! It’s pretty cool how everyone is on a more even playing field because of the fast-paced nature of the internet. There is so much information out there, and since it changes so fast we’re all kinda learning it as we go. You can do it! Thanks! I love learning and researching online. Can’t wait to see how our blogs and businesses will bloom this year:) Keep moving forward with your dreams and creativity! Enjoy your birthday! I now follow you on bloglovin’. I think you are a really great designer. I follow you and several other designers because I aspire to be able to do design work part time, eventually. Happy Birthday! I haven’t even heard of this book, but think that it should definitely be on my “To Be Read” pile. This is such an amazing giveaway! Thanks for the chance to win, Kate. For the record, I like you on Facebook. And I follow your Pinterest!